What the same-day released Go With Me from the light-weight Seapony could NOT satisfy with its lackluster surf-pop, Kids on a Crime Spree gleefully remedies with their heavy weight champion, power-pop, sha-la-la, rock ‘n roll triumph, We Love You So Bad. Taking a number from the nasally rock-revivalist Hunx and his Punx meets the golden-beige Jacuzzi Boys though somewhat less lyrically audible, Mario Hernandez, front man of Kids on a Crime Spree revisits those classic jive ‘n swan dive golden oldies with finesse and flair. Hernandez got his cold, dinner coffee sipping chops in gear as a band member of Ciao Bella and From Bubblegum to Sky some eons ago. While he theorizes that simplicity doesn’t necessarily have to compensate for complex lyricism, we can only poke the brim of our glasses and concur in nerdly delight. Satisfy all our hipster criteria, the Spree captured all of their 8 songs on old-school analog tape, to harp off this indie-obsessive trend of vintage recording and to keep the sound as close to inspiration, Phil Spector’s Back to Mono box set sound. Becky Barron (of Scrabbel and From Bubblegun to Sky) hits hard on the drums, with straight forward rhythms, while Bill Evans (also of From Bubblegum to the Sky) packs his guitar with plenty of growls. Hernandez keeps his promise of dinged and tinted lyricism with the opening suicide love song, “Don’t Want to Call you Baby, Baby.” Fans of Davilla 666 will appreciate the simple yet sophisticated chorus of “urban decaaaay, urban decaaaay,” on the soon to be sensation, “Trumpets of Death,” which claim the return of rock ‘n roll with contemporary concern and impressive scope. “Dead Ripe” gives hauntingly classic side-stepping guitar work not unlike our favorites Best Coast and Chicago avant-natives, Allá. While the opening feedback and distorted intros on “To Mess with Dynamite” and “Imposto,” both offer crimson and clover-esque, Ramone roaring, morose romance. The Sleater-Kinney chords on “Jean-Paul Sarte 2” scream of avid intellectualism. 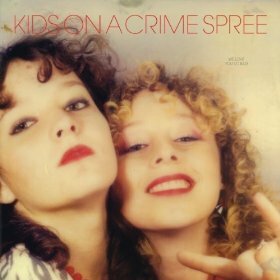 Kids on a Crime Spree is the future of indie rock! Savor the post punk vigor of each rapid-fire track as this debut EP whizzes past like Sonic the Hedgehog at a Grease Lightning drag race. Listen here to the golden oldies-style, “Sweet Tooth” off Kids On a Crime Spree’s recently released, We Love You So Bad off Slumberland Records.